According to the National Broadcasting and Telecommunications Commission, all mobile phone users must have their pre-paid mobile phone sim cards registered before July 31st, 2015. Sim cards that are paid on plans and paid monthly, are already registered. Anyone who has purchased a prepaid mobile phone SIM card in Thailand must “register” their personal details with their mobile network before July 31st. The new rules come into effect on February the 1st, after which users will have 6 months to provide their personal details (name, ID, and of course the phone number in question) after which they will not be able to use their SIM. If you are a foreign citizen resident in Thailand, you will need to take your passport to register at any of the “subscriber information registration points” setup at Big C and Tesco Lotus, as well as 7-11 stores. It will also be possible in the near future to register at Krungthai registration point, but the date has not been officially confirmed yet. If you are abroad between now and 31st of July, it appears that you will not be able to register by phone or the Internet, as it would impossible to prove who you are without showing your ID in person. it would be convenient if an Internet/fax/telephone registration method was available for these situations. With tens of millions of people needing to register, we doubt that anything other than turning up at a registration point will be accepted. 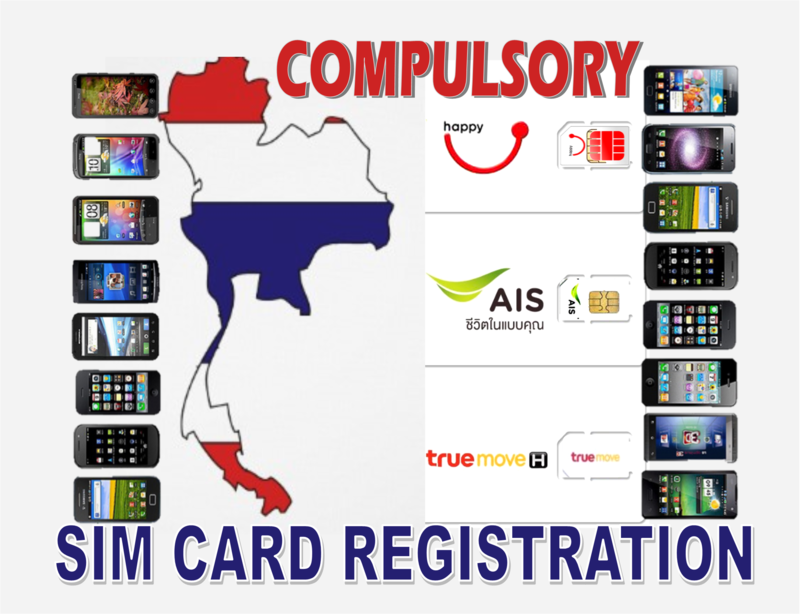 Tourists who come to Thailand for a holiday and purchase a prepaid SIM card will simply need to show ID at the point of purchase in order to qualify as ‘registered’. This means a passport (valid for at least 6 months, which it should be anyway if you just travelled here) in order to register your SIM card. If you have previously provided such information when you bought a SIM card in Thailand, it’s highly likely that you are not registered, we advise you to check your current status. There is talk of other options, however, at this stage the only method of registering your SIM card is to visit the local store of your mobile network provider. We advise everyone who uses a pre-paid sim card to visit your network provider at their local store. AIS: call 1175 from your mobile, or +66 2299 5000 from abroad. DTAC: call 1678 (press 7 for English) from your mobile, or +66 2202 8000 from abroad. True: call 1331 from your mobile, or +66 89100 1331 from abroad.